Journals Unlimited, Inc. donates $1.00 for each full size journal purchased wholesale through a KOA Campground, to the KOA Care Camps. We encourage each KOA Campground to match our contribution. There are 39 Care Camps across the country that help children with cancer enjoy an uninhibited social and recreation experience amoung other kids with serious afflictions. You can learn more about this wonderful organization by visiting their website. Employees at Journals Unlimited, Inc. participated in a fundraiser for the Lutheran Home Care Agency located in Frankenmuth, Michigan. The theme of the fundraiser was “Music, Massage & More.” We were part of their Complimentary Marketplace, in which vendors explained the various forms of therapies that benefit Hospice patients and their families. These therapies included music, massage therapy, reflexology, art therapy, aromatherapy, pet therapy, and of course journaling. We also donated journals that were put in gift baskets to be distributed to the main sponsors of the evening. We helped make centerpieces for the tables and props for the “Marketplace” to give it an authentic feel. The hugely successful evening was a sell-out,with Luthern Home Care Agency securing the largest sponsorship amount ever! 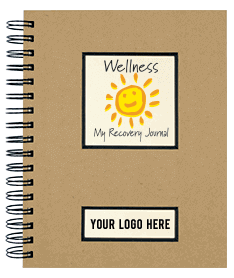 Journals Unlimited, Inc. is seeking sponsorship for Wellness – My Recovery Journal.Our goal is to provide the journals at no cost to any person afflicted with a chronic or serious illness. In return for your sponsorship, you get to pick the recipients of the journals while Journals Unlimited, Inc. will print your company name or logo on the first page of the journal, which shows through a die-cut window on the cover. The journals are priced well below wholesale for quantities ranging from 50 – 50,000. Please contact Shelly Walczak at Journals Unlimited, Inc. for special pricing. Call (800) 897-8528 or email. For the past 3 years, Journals Unlimited, Inc. has donated journals to the Children’s Grief Camp hosted by Lutheran Health Care, located in Frankenmuth, Michigan. These Children, who have experienced the loss of a loved one, are taught how to journal as a form of therapy.